At almost 500 pages and sixty stories, this is a far more comprehensive Spirit collection than any previously issued. It covers not only Will Eisner’s involvement as creator, but a fair smattering of strips without him. These are not only from more recent years when the character has been licensed, but from the 1940s when others continued the strip while he served his country. 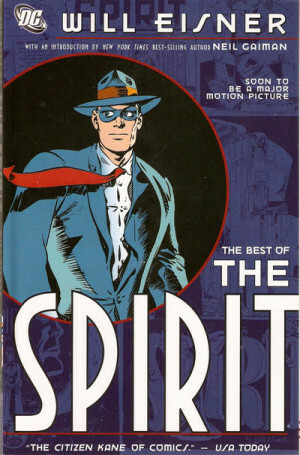 Given what this book encompasses, the only complaint concerns what’s not included, and some insight would be welcome, perhaps in preference to DC reusing the introduction Neil Gaiman wrote for 2005’s The Best of the Spirit. Some stories widely reprinted previously are omitted, while others, presumably due to being so well regarded, are seen again. Yet why is a story by Alan Moore and Daniel Torres deemed preferable to any of three Moore produced with Dave Gibbons, surely more crowd pleasing? 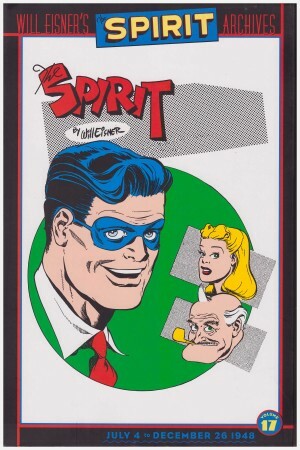 The commitment to a wide-ranging selection also results in a minor quality dip, as we’re not just presented with Eisner’s prime 1946-1950 period, but The Spirit from before and after. As this creams the crop, it can be taken for granted that any immediate post-war Spirit with Eisner’s hand is going to be excellent. Whether whimsical or noir, drawn by John Spranger or written with Jules Feiffer, these are masterpieces of compressed drama reviewed for other Spirit collections as signified below. Better, then, to concentrate on the material falling outwith those years. A 1970s P’Gell story is a four page anomaly with content racier than usual and the art far looser than the earlier material. It was produced for an underground comic reprinting other P’Gell stories in black and white, and while Eisner claimed it was a script leftover from the 1940s, a theme of lesbianism renders this unlikely. 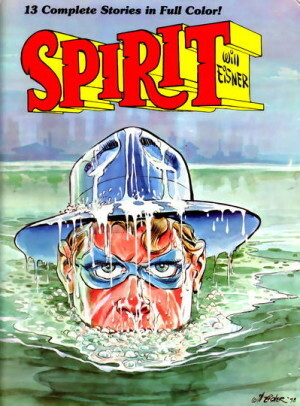 It was Eisner’s final Spirit story, and he’d lost none of his skill. A 1943 tale ‘The Last Mile’ indicates how his plotting would progress. It sets up the mystery of how a dead man could commit a murder, the type of conundrum that always appealed to Eisner, but later stories would pack in more plot over seven pages. This is drawn by Lou Fine subordinating his own glorious style to Eisner’s layouts, resulting in art that’s competent, but uninspired. Yet compare it to the opening tale with Eisner’s own art. For all the crudity, the signposts to the future are there with Denny Colt spotlighted in a shadowy city, the ornate equipment in Dr Cobra’s lab, and a story set in the shadier portions of Central City. The Moore and Torres’ story is a fine tribute to the mythology of the Spirit, set in the future. It’s better than Gaiman’s rather mannered hack movie writer as a passive observer of the Spirit in action. Eddie Campbell’s sketchy style isn’t suited to the Spirit, and tightening it up introduces stiffness. Credit, though, for creating a new femme fatale and attempting to pass her off as revived. 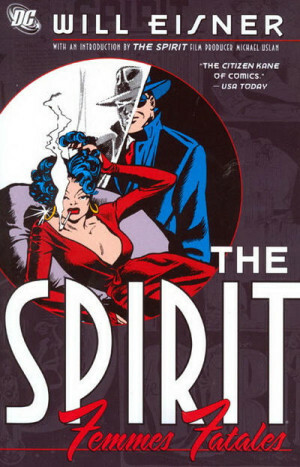 The books closes with the longest story, a teaming of the Spirit and Batman by Jeph Loeb and Darwyn Cooke. A decent romp, again, it’s a peculiar choice, given Cooke on his own produced better solo Spirit material. Perhaps the selection was due to the skilful manner in which Loeb incorporates both a significant number of Batman villains and much of the Spirit’s supporting cast. 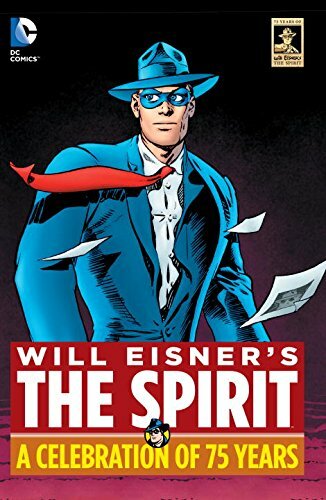 While providing a fine overview, money available for this collection might be better exchanged for a concentrated dose of the best Eisner material, found in Spirit Archives 14–19.